Hey,I’m traveling to Europe for a few months soon and just gathering the last few things. I’m not wanting to take anything with lithium, already taking enough between camera, power bank and phone. Also want AA for simplicity of batteries, although I’m taking eneloops. So, I’d like a light with maybe 3 modes, moonlight, low/mid and high. One that’ll start of moonlight or able to save it so. Probably on the floodier side. No real preference on switch’s. I recently purchased the Sofirn SF14V2.0 for $12.99 through Amazon via the Sofirn Facebook deals page. It was shipped free (Prime-eligible) from a US warehouse, and arrived in about 3 or 4 days. I too was looking for a simple light, as a gift for a non-enthusiast who appreciates high performance. This one seems to fill the bill. It has three modes (low, medium, high), no blinkies, and no memory. Just click to turn on (always starts in low), and half-press to cycle through the brightness levels. Click again to turn off. That’s it. I think the levels are very well-spaced … all three are useful, and differentiated from one another. On high, it’s blindingly bright for a AA light. I compared it side-by-side with my Zebralight SC-52W using a pair of identical IMR14500 batteries, and the Sofirn is brighter. So the factory claim of 650 lumens might not be that far off. It does light up my entire backyard. It includes a lanyard, a decent pocket clip, and spare O-ring. Edit. I wouldn’t call Tool floody. I would consider the Convoy T2 also. Do they still use low frequency PWM? May I ask you a question? Tell me the stepdown from high mode to the average after 3 minutes works both for 14500 lithium battery and for Nimh battery, or for 14500 lithium battery only? The Convoy T2 still uses noticable PWM, but there has been worse. It is about 800 Hz and I have seen 100 and 200 before. For people who are not specifically sensitive to PWM, the T2 is fine. What about Sofirn SP 10A/B (V 1.0 if possible)? I subscbribe to this !! It is on the Neutral White side, has hotspot but is also floody! Takes AA, NiMH and 14500 Li-Ion! EDIT: There is a also the Jaxman E3, a robust AA light that has only 3 modes and Nichia LEDs inside!! Ultratac a1 or one of those AA sofirns, the Sf14, start always in low. what’s the difference between sofirn Sp10A and SP10B? As far as I remember, it was mainly the UI that was different on the 1st models of the SP10A (no turbo, no electronic lock out) and B (turbo, lock-out). Then the SP10A and B become the same, only the external colours differed (A = black host, B = red and blue hosts). This was before the V2 were released. In short: Sofirn made a mess of their model numbers. Even Barry was worried about that and wanted to sort out the model naming. Ah thanks. was about to ask about the v2.0 version. For under 11€ euros on aliexpress with an UI like this, this is a steal. 5200-5700k is not my favourite, but alright. I also liked the SF14,because it is even simpler and has a tailclick. Sofirn really should rethink their model-naming..
sf14 and sp10 are AA.. then SP31 a rechargeable 18650, sp33 is 26700, SP36 is a 3×18650 lumen monster.. Hard to remember which model is which..
is ist better to pick the SP10A/B or the SP10v2? just looking through sofirn’s alixepress page.. then there’s sf10, sf12, another sf10 pictured but without model name.. I am confused as hell..
sf12 seems to do just the same? is that right? sf14 starts on low, has no strobe, costs ca. 10$ and 3$ more for 14500 battery and charger. Tint is not specified and has clear reflector. SP10v2 has Orange peel reflector in the black and clear ones in the colored versions. I guess it boils down to if you like a more defined hotspot or not and prefer tail or sideswitch with shortcuts. Remember that side switches tend to activate easily in your pants or pack. So I would either lock it out by unscrewing, or better go for the tool AA. Never fun to find your flashlight depleted when you rely on it. I travel a lot and tried a lot of side clickies. Now a no-go for me. I prefer tailclickies for that reason usually. But I like the sideswitch on my wuben e05. That one is pretty firm. I have it in my jeans pocket since a week now and it never accidentally turned on. Also a nice light. I bought the version from TLF,which has no strobe but a shortcut to low instead. I like it, but kinda pricey. The Sofirn Sp10 seems to work similar and is a lot cheaper. My copper tool AAA accidentally turns on a lot more often with tailswitch. TOOL 2.0 is also my favorite. 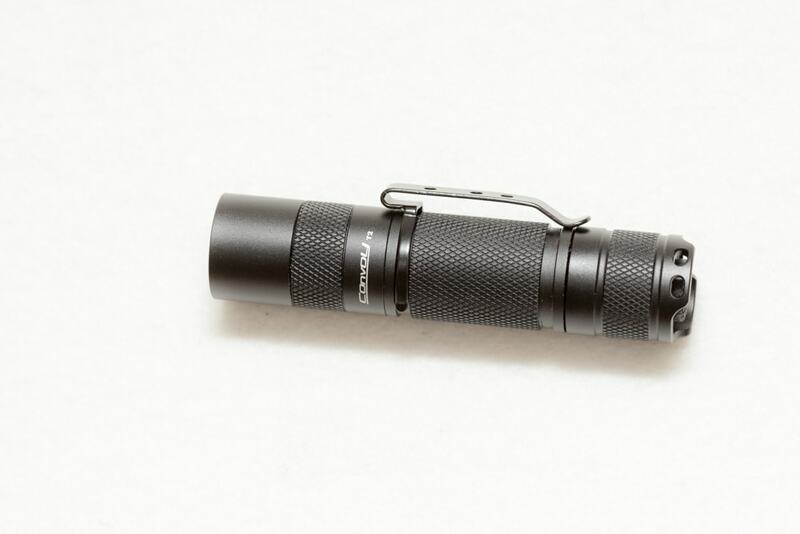 Second fav is BLF X5: a pocket rocket. Ok, good you thought it over! I evolved from twist- to side- to tailclicky for my EDC light. I hate fiddling around to find the switch, too. But if side switched lights improve, I just might reconsidder it in the future. is this still the case or did sofirn fix this? By the way, is that an e- or clicky switch on your tool aaa? I did’nt like the Ti version because of the tail e-switch turning on all the time. Simple. Small, reliable (I bought 4 for family) ALL still workin. AA to Lithium. Twisty sw. 3 stages, and I think a flasher in there somewhere. Well made. Looks nice. Fits in pocket unobtrusively. and stick it in corner of bag. Fits on keyring nicely, you don’t even notice it being there. Backup. “I” think it the nicest looking small torch out there. Canaries and Gib early next month from Aust. Plus just buy a little Astrolux AO1 AAA. (Around $6/7 US) and stick it in corner of bag. Miniscule. Good spread beam with a little reach. Twisty again (I like ‘em) Fits on keyring nicely, you don’t even notice it being there. Backup. “I” think it the nicest looking small torch out there. Enjoy your trip, we going to Med North and South coast. Plus North Africa Canaries and Gib early next month from Aust. I really like my Astrolux. Friendly colors (love the green) and you can hold it between the lips pretty comfortably if you need free hands. But make sure you invest 3 minutes to do this, to remove the next mode memory. Another suggestion.. since you should have a backup AAA light anyway and carry a powerbank anyway.. consider the On the Road M3pro. You can charge the 16340 battery on your powerbank and fully use the light while connected to the powerbank even without battery. Has a magnet, reverse clip for clipping to hat. I think this thing is a pretty good travel companion when you have a mobile charger and a powerbank with you anyway.. on boards USB-C charging. but a micro-rechargeable 14500 or just eneloops will probably also work just as fine. Utorch UT-01 has been good for me in that form factor (I EDC a Zebralight SC62w…and sometimes Emisar D4…but pick up the Utorch when I’m looking for smaller). I have the NW version and really like the beam…subtle hotspot on the floody side. I actually sold my Nitecore EA11 after getting it because I liked the beam better for EDC. VERY compact light. Runs really well on AA battery but can really kick it out with 14500 if you feel frisky. I will say it ends to perform a little better on good quality rechargeable AA’s then it does on alkalines…but not a huge difference. Comes on to moon every time with a click OR you can long press to come on to the last used mode. I recently bought a SP10 V2 and the UI on mine has minor problems. 14500 – mode memory, no shortcut to moonlight, double click to turbo, triple click to strobe, 4 clicks from off to lock-out, 4 clicks to unlock. AA NiMh – always starts in low, no shortcut to moonlight, double click to turbo, triple click to strobe, 4 clicks from off to lock-out, 4 clicks to unlock. I took the light on a vacation to Europe recently and liked it a lot. Ran it with a Eneloop and it was bright enough for my purposes and much more convenient to carry than the Convoy S2+ I usually bring.